Fathers Day is just as important an occasion as the one we like to celebrate for our Mums, so make a fuss of him too on his special day and he will love you for it! We all like to send cards to Mum or female friends because they are so easy to do but don't forget this Special Day for your Dad and make him a card he will treasure simply because you made it for him. 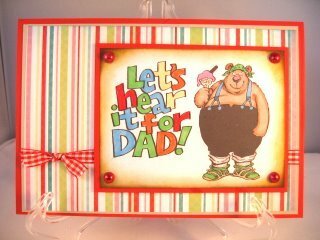 Let your Dad know how much you care for him in a beautiful card that you have made. Fathers Day is celebrated on various days around the world so check the date for where you live. But whenever it is in your country it's never too soon to get busy making it. If you are really stuck for ideas for that special gift for your Dad then give him something that he can use to choose for himself ... here is the answer ..
And this is Jim again enjoying another one of his leisure activities. Who says men don't wear pink!! 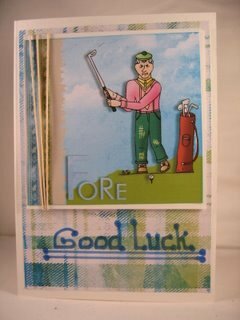 But maybe your Dad enjoys fishing, golf, DIY, football, darts, gardening, snooker and motor racing. These are some of the ideas that could be used on the cards you make. 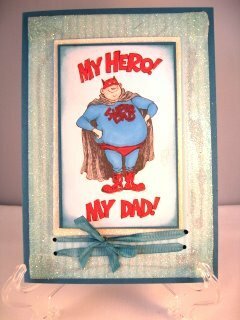 Cartoon characters are always a big hit and perhaps your dad is a super hero to you....so why not let him know it. 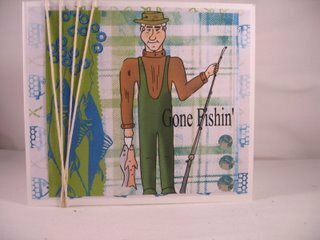 And these are the type of cards that any young child would be happy to give to their Dad.